You can’t eat your way to enlightenment. But you can eat in an enlightened way. In this whole discussion about diet, a spiritual path, and health, it’s useful to make a distinction between what we can call “sentience” and Consciousness. If there is sentience, there is the potential for suffering. And while everything has consciousness in the sense that everything is within consciousness and is therefore a “manifestation” or “modulation” of universal awareness or presence, not everything in awareness exhibits sentience. I rarely have conversations with rocks, flowers, squirrels, or sleeping people for example, because I just don’t get much back. That’s a little joke (a very little one) but my humor has a point: sentience is a matter of degree. 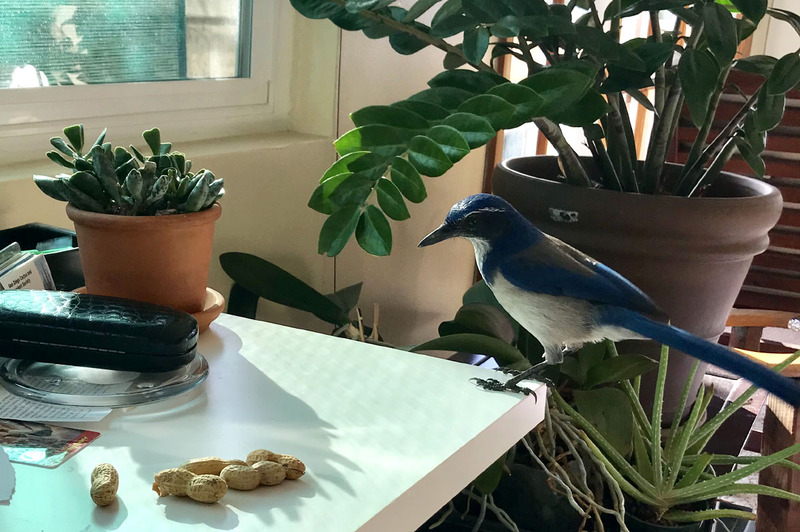 While I won’t talk to rocks (normally, without a bottle of wine under my belt – which I no longer do), I will however have a conversation with the Blue Jay that comes and gets peanuts from my hand at my house. Why? Because it’s fun and I think he’s starting to pick up on the sound of words like “peanut”, with his bird brain being trained. He has some sentience. I think there is clearly enough sentience observable in animals (such as the Scrub Jay) to potentially experience pain and fear and thus suffering. But they don’t say to themselves “Damn! That human hurt my leg! I hate him!”, nor do they add psychological suffering via thinking. But there are enough emotions and sensitive feeling-awareness in dogs for example, that I have great compassion for them. However they can in no way transcend the body as humans potentially can (as far as I know) – this is however another reason for compassion, as they are completely “at effect” from conditioning, genetics, and environment, as are all animals (and plants, insects, amoebas…). I do however still eat seafood occasionally. Perhaps I haven’t observed fish enough (or large fish like Tuna being caught), but I have a hard time feeling deeply for them as profound sufferers. Besides, most, such as anchovies, are being eaten by the trillions every day by larger creatures. What to do? Stop the whales and tuna from feeding? Clearly it’s an issue of what a human being, as a self-aware sentient creature, potentially seeing his universality, feels is ethical and healthy. But this is not something to impose or force by law or as a creed or belief system, but individually as one sees and feels inside. For example, from seeing (and smelling) first hand how cattle are kept in industrial sewers (basically) and then not always corralled or slaughtered humanly, plus the deleterious effects on heart and health and potential for cancer (from chemicals and the stressful, miserable lifestyle of the animals affecting the energy and chemistry of the meat), I don’t eat beef or any four-legged critters. I only eat chicken or turkey rarely at this point, for example for convenience on a camping trip when there aren’t options for sandwiches, or portable as concentrated food (turkey jerky – though now there are vegetarian jerky options) or what is available from other people serving it. Ethically, if you consider that everything is connected, all at once, now, then if you eat an animal, you in effect (in cause) participate in it’s killing. So the question is, if that animal were in front of you, would you want to kill it? We are not talking a survival situation where you had no options, but the situation most of us in the “civilized” world find ourselves: at a grocery store or restaurant, with many, many options. We are not living in the Arctic with only the flesh of seals and whales, and a few fish, to choose from. There is an abundance of things to freely pick among, and a vast store of knowledge about food, diet and health (too much information, most of it opinions and fads: cultural noise!). So keep it simple: what is your body telling you—not your mind—what are your true feelings, conscience and inner natural intelligence quietly saying? Wake up to that, and you’ll know what to eat, and let your body do what it does without the interference, force or violence of the mind or culture. Inner conflict, guilt and fear are completely unnecessary and artificial. Be at peace and eat.